When you are out riding, cruise by and vist our store. The coffee pot is always on. Enjoy a free cup while shopping for apparel, looking for parts, getting your bike serviced, or just shooting the breeze with us. We like to talk about bikes and just about everything that is going on in the biker world. 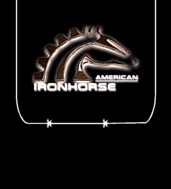 See our full line of American IronHorse Parts & Apparel. Check out our Leather Apparel! We have the best prices in the state.